. : Optics & Photonics Focus :: Restless Cells in the Human Eye :. A cone cell. Schematic representation of a cone cell. The photosensitive part is the outer segment of the cell: the upper part where the various layers of cell membrane can be seen. We see and enjoy the colors of the world around us thanks to the cone cells in our eyes. These cells grow and shrink continuously. Why and how this happens remain open questions, not least because of the real challenge inherent in tracking their size changes in the living human eye. Ravi S. Jonnal and coworkers at Indiana University in Bloomington, USA, have devised a novel technique to measure in a single cell these changes, which are often as tiny as a few tens of billionths of a meter. This type of measurement may help researchers identify, and hopefully treat, medical conditions associated with color vision. Cone cells are at work in the retina, a tissue lining the inner surface of the back of the human eyeballs. 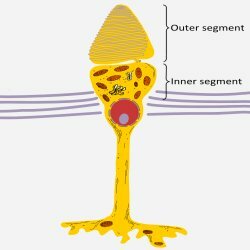 The actual sensing is performed in a portion of the cell known as outer segment. This is, essentially, a very thin membrane folded hundreds of times to form a stacked structure. The thickness of each layer of this structure is only 30 nanometers — over a thousand times thinner than a human hair. New layers continue to form, while old ones dissolve, in a dynamical process where the outer segment grows and shrinks in a matter of hours. "Renewal of the outer segment is of broad interest," Jonnal explains, "since the process is a cornerstone of cone homeostasis and cellular survival. It is of interest to basic science investigators and clinical investigators alike, since deficiencies in renewal are likely tied to disease progression in several pathologies: age-related macular degeneration and retinitis pigmentosa, notably." Measuring the growth process of the outer segment in the eye of a living person is extremely challenging. In fact, there are two major problems. On the one hand, the change in length associated with the formation or dissolution of a layer is minuscule, down to just a few tens of nanometers. On the other hand, this change is easily overshadowed by the subject’s movement, as even involuntary eye movement can easily be millions of nanometers wide. In order to solve the first problem, Jonnal and coworkers used a very well established optical technique to accurately measure the position of an object: Optical Coherence Tomography (OCT). OCT relies on a very precise clock: that which is inherent in the periodic oscillation of the electromagnetic fields associated with a laser beam. To be more precise, OCT takes a laser beam and splits it into two, each one with its own internal clock. At the beginning both clocks are perfectly synchronized. However, if the two beams go along different paths and are then recombined, one of the two clocks may be delayed. Measuring this delay allows us to estimate the difference in length between the two paths. In Jonnal’s experiment, one beam was shone on the retina and came back, while the second one was used as a reference. In this way, they were able to measure positions with a precision of down to 45 nanometers, almost the size of a single layer of the outer segment. In order to solve the second problem, Jonnal and coworkers have had to adapt OCT to counteract any movements of the subject’s eyes. To do so, the researches did not measure the absolute position of the cones, but the difference in the position between the top and the bottom of the outer segment. Think of a woman who wears heels of a different height each day. If we want to measure how tall she is, we need to measure her total height and then subtract that of the heels. "I chose to monitor phase differences between two reflective layers in the outer segment, because these differences are insensitive to eye movements," Jonnal explains. The researchers used this technique to measure the growth rate in hundreds of cones for several hours. They found it was only 150 nanometers per hour. A very small number, but still about 30 times faster than the growth rate of a human hair. For the future, Jonnal is confident that the technique he developed with his colleagues will become "very significant for basic scientific and clinical research. It may allow clinical researchers to learn more about diseases that affect the photoreceptors, providing knowledge which in turn could have an impact on the lives of many people with blindness-causing diseases." Ravi S. Jonnal, Omer P. Kocaoglu, Qiang Wang, Sangyeol Lee & Donald T. Miller, Phase-sensitive imaging of the outer retina using optical coherence tomography and adaptive optics, Biomedical Optics Express (2012) 3, 104-124 (link).